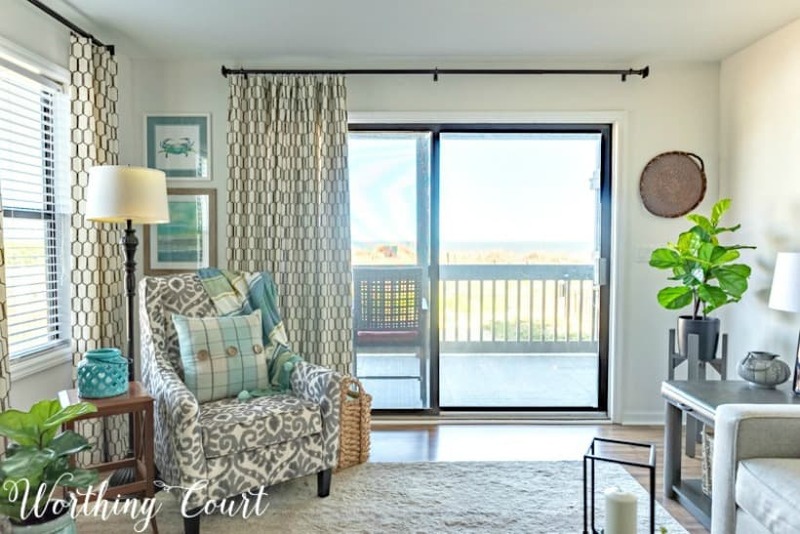 Take a video tour of a modern farmhouse condo filled with beach house decorating ideas. 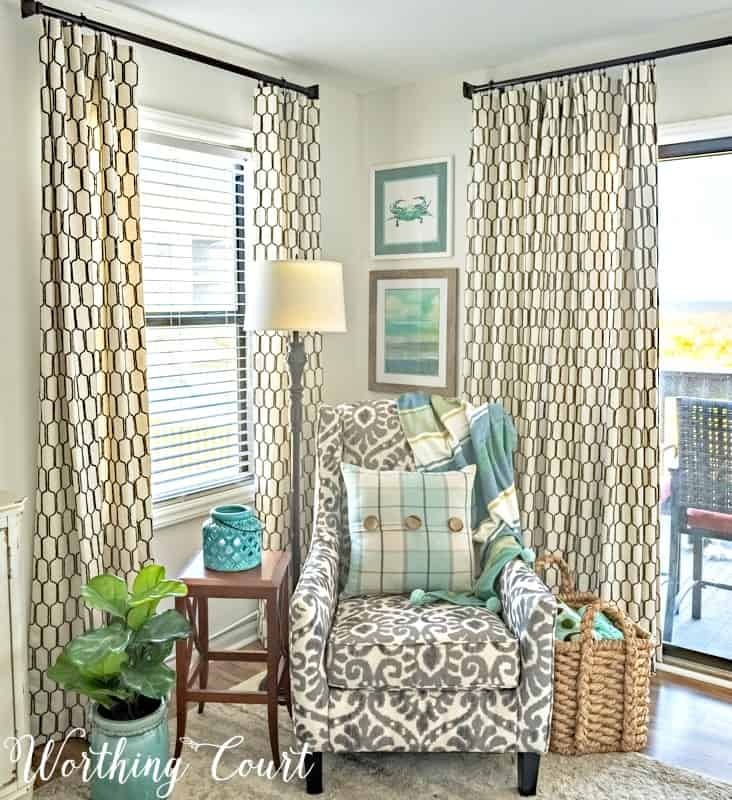 If you love coastal decor, without going overboard, this tour is for you! We’re still finishing up the makeover of the bedrooms and bathrooms (see my plans for the master bedroom HERE), but I’ve shared lots of individual projects of the other rooms that we’ve completed so far – the living room, kitchen and dining room. So I thought it would fun to do a video tour of those main rooms because some things just don’t come across as well in still photos. The video is a fun way to take a closer look at things, to better show you how all three of the spaces tie together and to talk about my resources. The video is located down below, but before we get to the tour, let me show you a before and after of the spaces that we’ll be taking a look at. 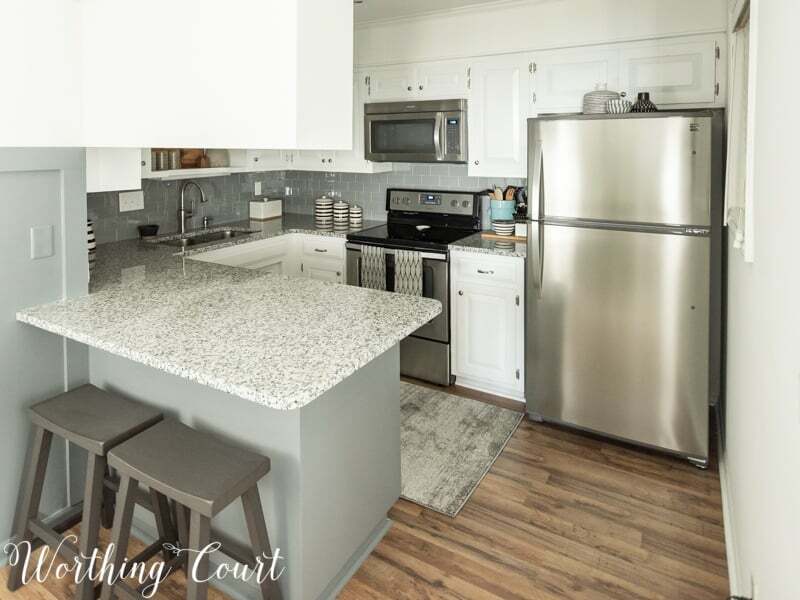 These will serve as a refresher if you’re a long time Worthing Court reader and will give those of you reading for the first time a better idea of how far this condo has come. Click on the name of the room above the photo to take a tour of the entire space. In addition to using it themselves, the previous owners of this condo used it as a rental and it showed. Every single thing in the living room was tired, worn and dated. The carpet was icky-sticky, the furniture was gross and saggy and everything felt generally dusty and grimy. We donated nearly all of the furniture, repainted the walls (Sherwin Williams Snowbound throughout the entire condo), replaced the ceiling fan and replaced the carpet with laminate flooring and an area rug. After the major changes were made it was on to the fun part – making the space pretty! In came new furniture, diy draperies and fun accessories. All along, I’ve been working toward a modern farmhouse look with just a nod to the fact that this place is located oceanfront. No tacky beach tchotchkes allowed. 😀 In the video, I’ll explain how I accomplished capturing a coastal feel without going overboard. The dining room in the condo does double duty. In addition to being the place where we eat, it also serves as the entry area into the condo. It was a bit of a dilemma to figure out how to treat a room with two totally different functions as one, but you can see how I accomplished that in the video. 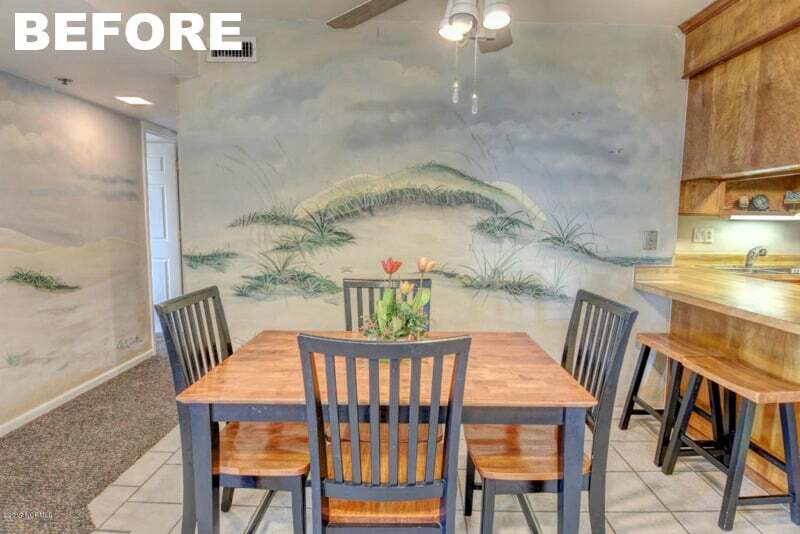 Two of the walls were covered with a wallpaper mural, the flooring was ceramic tile, the table was way too small and I’m not a fan of having a ceiling fan above a dining table. Who wants to eat cold food??? Some of the tiles were broken, so out it came, along with the carpeting that ran along the edge, and in went laminate flooring. We removed the wallpaper murals and added board and batten to one wall, which is painted Sherwin Williams Software. The back of the peninsula was painted the same color as the board and batten wall to help tie it all together. A large’ish chandelier, which serves as the main light, makes quite a statement in the space. I kept the original chairs and barstools and painted them with my favorite spray paint, but we replaced the table with a larger one and added two wicker chairs to each end of the table. A beautiful area rug, the addition of some artwork and cool mirror and another piece of furniture completed the space. 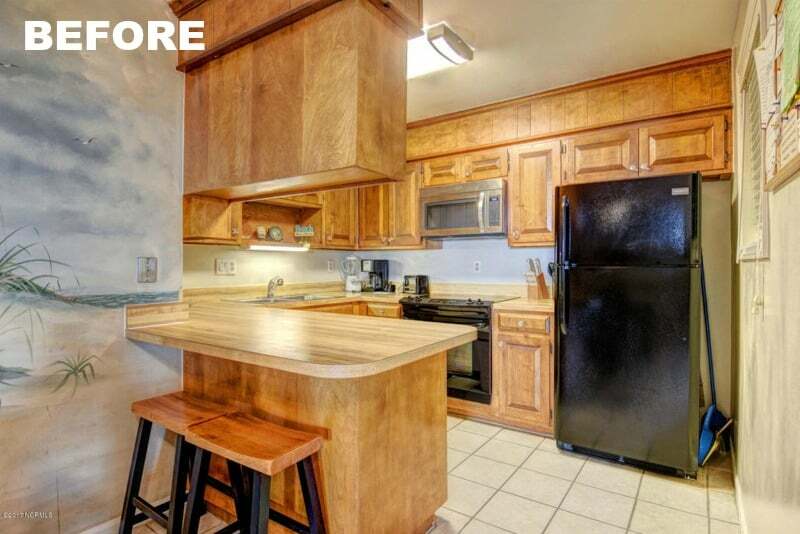 The kitchen is a small galley kitchen and the before photo pretty much speaks for itself – greasy and grimy dark cabinets, worn fake butcher block laminate counters and older mismatched appliances. At least there wasn’t an ugly backsplash that we had to remove. This is the one room in the condo where we spent a significant amount of money, but by careful shopping we were able to keep the cost down. In the video you’ll get a closer look at other details that we added and a couple of projects that are yet to be completed. The cabinets were painted, instead being replaced, the granite counters are made from remnant pieces and the appliances are all just basic models. Painting the cabinets white (Sherwin Williams Extra White) totally transformed the space! Now that you’ve taken a look at the individual spaces, you’ll see how they all flow together in this video. Enjoy and thank you for stopping by! The Beach Condo looks amazing!! Looks great Suzy! If you ever decide to rent it out please let me know! I’d love to spend a weekend at long weekend at Topsail. 🤪 Love to spend a long weekend at the beach. What an amazing transformation! The beach condo looks wonderful! Loved the video! Your beach condo looks amazing! Thanks for sharing it with us in the video tour. Enjoyed viewing your beach condo video. Amazing how much furniture you were able to nicely place in the living room. rooms in our home in the same way. Hello! I’m a “newish” follower and this is my first time commenting. I LOVE your beach condo! Your video tour was great and I felt like I just walked in and you welcomed me into your condo. Question about your painted knife block. Did you have use spray paint or the paint from the kitchen cabinets? Did you prime the wood first? Hi Heather. Glad you enjoyed the video! I just used plain old white spray paint with a gloss finish on the knife block, without priming it first. I recommend wiping it down with some sort of degreaser, like TSP, before painting though. And if yours has a glossy surface, you might give it a light sanding first..
Hi Suzy, loved your tour! When I’m looking at what someone posted I’m always wondering what the rest of the place looks like so it was nice to see everything together. I think the bifold doors should stay white. I agree with you that it would be too much grey and with the white, they add just enough contrast for your plain wall. I like the fact that you bought things from WalMart and Target. Not everyone can afford the more expensive stores and you showed that you don’t have to spend a lot of money to look like you bought at an expensive store. I can’t believe that the bookcases came from WalMart! I love them! Truly enjoyed your tour! Hi Suzy! Amazing job – it feels so cozy and classy all at the same time. We rent a condo in Mexico for part of the winter (Canadian Snowbirds) and I am dying to give it a makeover but because it’s not ours, I just daydream about what I would do 😉. Thanks again for all the inspiration and the video. I feel like I just had my own personal tour. Your condo turned out great. I love how you used things you already had or bought new items at affordable stores. I wouldn’t change a thing! Hi Suzy! Your condo redo is beautiful. You did a great job! Since we just got back from a week in a condo in Florida, I’m now dreaming of owning one myself. I have a question about the dining chairs you painted. 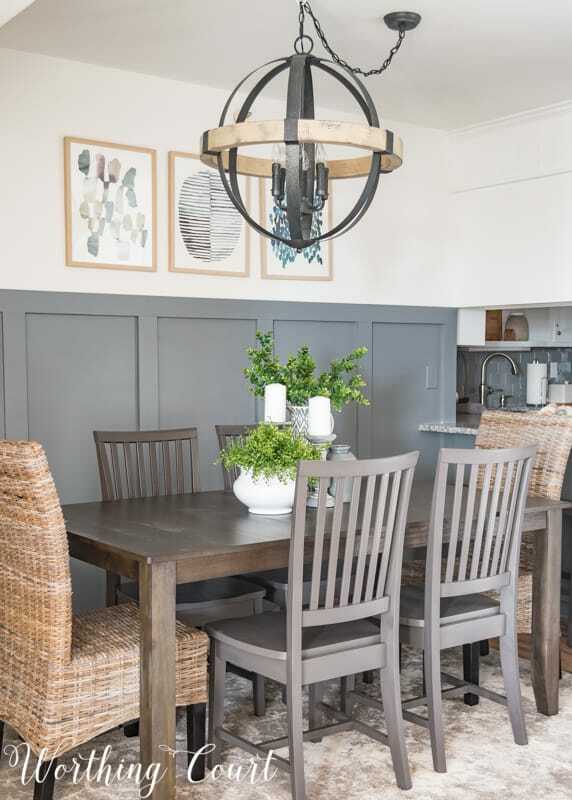 Did you spray paint or brush paint the rustoleum anodized color onto your chairs? They turned out beautifully perfect. Hi Pat. So glad you like the condo! The chairs are spray painted with two coats of paint. Thanks for inviting us into your condo. It shows that you have all worked very hard. The kitchen is a huge upgrade with the white cabinet paint and the new countertop. The whole condo has a nice beach theme while still looking classy. You’ve done a great job redecorating the condo. It looks refreshed and inviting. However, I especially love the neutrals that are in your home living room – the ones at the beginning of your blog when I click on it in my email. I like the off white with brown plaid. It’s just gorgeous! Wow looks great! I think you could paint the shutters behind the tv the same color as the tv stand. It would look like a cohensive wall unit. I would to to see how you decorated the bedrooms .